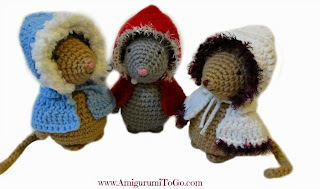 so I will also post a scarf pattern for the mice. And yes there will be a video tutorial for the cape and as soon as it is ready UPDATE: Video now available here. VIDEO tutorial now available For The Cape! 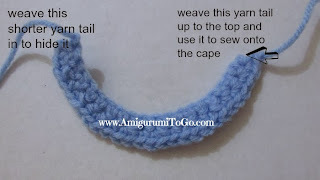 CAPE: *for the first dc stitch only of each row after row 2 you will start with the 4th st from the hook. f/o leaving a good length to work with later. Weave yarn tail from the bottom where you f/o to the top. You will use this after to either sew a button in place or just use it to tie with the other side to close up the cap. 3-7) ch 3 and turn, 1dc in each st for 5 rows *remember to ch 3 at the end of every row and for the first st only of each row you will start with the 4th st from the hook. f/o leave long tail for sewing. Fold hood piece in half and whip stitch the top of both edges together, go through both loops of each stitch on both sides of the hood. 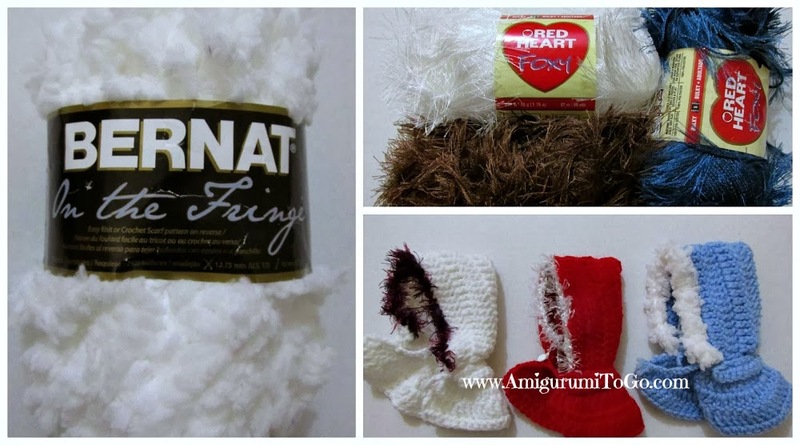 Once you reach the end knot off neatly and weave the yarn tail in to hide it. First sew the hood and cape together. Turn the hood upside down and whip stitch the bottom edge of the hood to the top edge of the cape as shown. The bottom edge of the hood is a bit longer than the top edge of the cape so you need to push the hood edge from left to right as you whip stitch along. You don't need to push much. Stop every now and then and check on the ends and to make sure they will meet up when you are done sewing. f/o and weave yarn tail in to hide it. Decide now how you want the cape to close. (Also see Granny's outfit for another option.) You could leave the yarn tails as they are and just tie them together or add a bead to each string or you could sew a button in then make one of the yarn tails into a loop that goes over the button to close the cape. I've done all those options and they all work great! 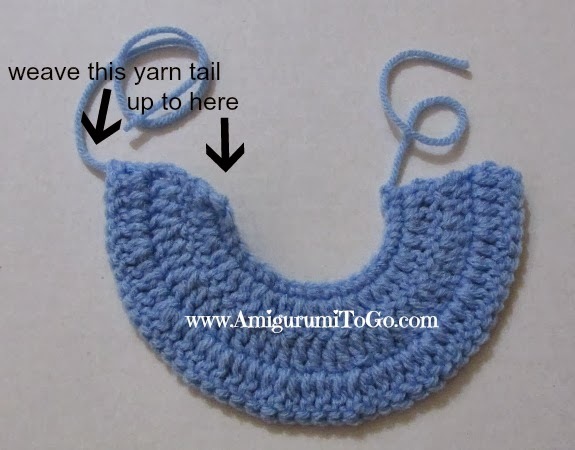 You could also leave the hood edge as it is or add a decorative edge using a specialty yarn as I did. The choices are endless really. You could add a decorative edge to the cape as well if you wanted. Pictured below are some of the specialty yarns I used. Pull the decorative yarn through the edge of the hood, ch1 and then sc around the entire outer edge, f/o once you get to the other end and weave yarn tail in to hide it. I have the same love for them! I am collecting all the books about mice or rats I can find. If you ever get the chance look up Maggie Rudy MouseHouses http://mouseshouses.blogspot.ca/ she has some of the most awesome mouse scenes ever. When you scroll to the bottom of her blog be sure to click older posts for more! I admire people like you that can create such a beautiful ideas... I wish I could do the same for others... I can draw but I'm not a crochet /knitting expert... I wish so much to learn more and create my own patterns! And when I create, I always smile.... Art is what make an artist fell really happy. Watch my Blog below, SOOOOO CUTE! I could just die!! these are so cute!! I have about four projects on the go. Everytime I see a new pattern I have to start it. I do say to myself must finish this one first. I haven't been crocheting for very long but I'm totally hooked. Thank you so much. I crochet my first mouse for my husband. He loves her. Now i make clothes for the mouse. Sorry for my bad english. I made a pair for my dear sister-in-law who loves mice. She calls them Pixie and Dixie. 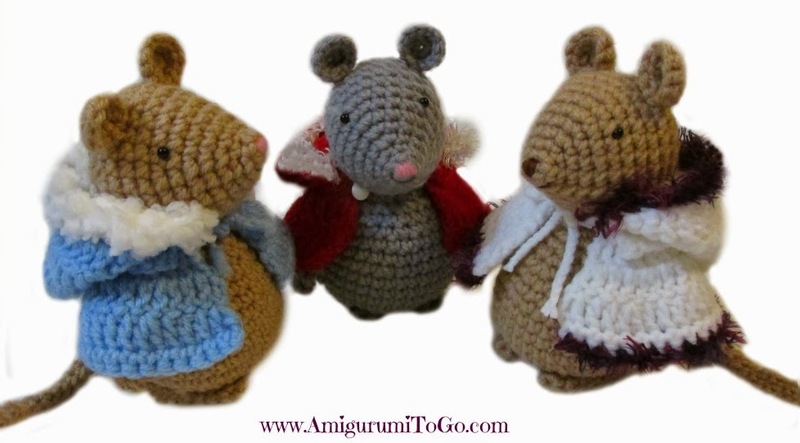 Each month I crochet a new accessory for the mice for the holiday,season or special event in that month. I only have three months to go and she'll have a full years worth. I really love finding and creating each month's outfits. Thank you for posting this awesome pattern. I am just learning crochet, and your hooded cape is the second pattern I've every made. I really appreciated how clear and understandable your instructions were. Most just look like gibberish. Yours made sense. I also really appreciated your video, which helped a lot. The style of teaching you used on the video was particularly clear and helpful because you elucidated WHY things are done in a certain manner instead of simply demonstrating mechanical motions. I made your hooded cape for my 3lb chihuahua. I used a slightly bigger hook, but otherwise I used all the same chain counts, but made the cape a few rows longer and the hood a row deeper, plus added some extra V-stitching (which I learned from the first pattern I ever did!) for edging. Your cape pattern fits my little dog perfectly. Thank you so much for sharing your talent. You're an excellent teacher. Will this fit your other amigurumi? I'm currently making the bear and would love to make it a cape. Sharon could you leave out the back collar out ?Or do you need the back collar. Hey do you have a pattern or a video of a Horse. I have learnt to crochet watching your videos. Thank you so much.